A Good Samaritan helped to keep a World War II veteran safe from a fire in Boyle Heights, Los Angeles on Sunday, March 27, 2016. 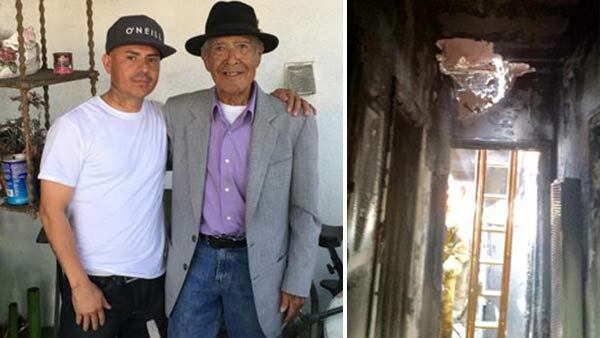 BOYLE HEIGHTS, LOS ANGELES (KABC) -- A Good Samaritan's quick thinking helped keep a World War II veteran safe from a fire in Boyle Heights, according to the Los Angeles Fire Department. Officials said a fire broke out at a home in the 2500 block of Cincinnati Street just before noon on Sunday. The fire department said a man, only identified by officials as Andres, was driving pass the home when he saw smoke and noticed an elderly man on the front porch attempting to go back inside. Andres stopped his car, jumped the fence and sprinted to the 90-year-old man's aid, according to firefighters. The two waited safely outside for crews to arrive and battle the fire. Firefighters were able to bring the blaze under control in less than 20 minutes. The fire was possibly caused by candles, according to officials, and the estimated cost of damage was $150,000. Fire officials said thanks to Andres' selfless actions, there were no injuries in the fire.